Three award-winning advertising executives prove that in business, Sacred Cows deserve to die. -Always Trust Your Research. BANG. Research should be used to demystify decisions, not make them for you. -The Customer Is Always Right. BANG. Except in those instances when they are woefully wrong. -Always Focus on Solving the Problem. BANG. Focusing instead on the opportunity not only solves the problem but leads to more imaginative and lasting solutions. -Follow the Leader. BANG. Doing so only plays to his strengths, not yours. After all, he drives the category. -Focus on the Numbers. BANG. Great numbers are a by-product of great strategies. -Teams Create the Best Solutions. BANG. Team dynamics usually kill great ideas. -Internal Competition Leads to Better Results. BANG. It only leads to resentment. 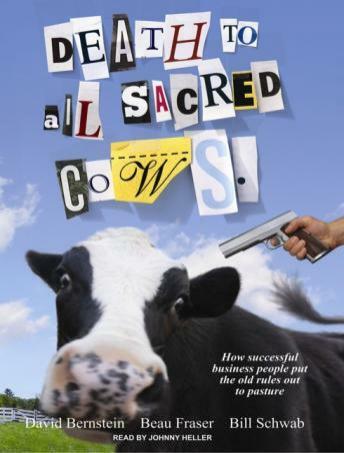 In this hysterically irreverent and wise book, Beau Fraser, David Bernstein, and Bill Schwab share their successful approach to euthanizing Sacred Cows through humorous and vivid real-world, global examples.